Antje Jackelén present Bishop of Lund in the Church of Sweden has been elected Archbishop of Uppsala. She will be consecrated the first female Archbishop next year. Her Arms will then cease to quarter the personal Arms with the Grill from the Diocese of Lund and instead use the Cross from the Archdiocesean Arms. 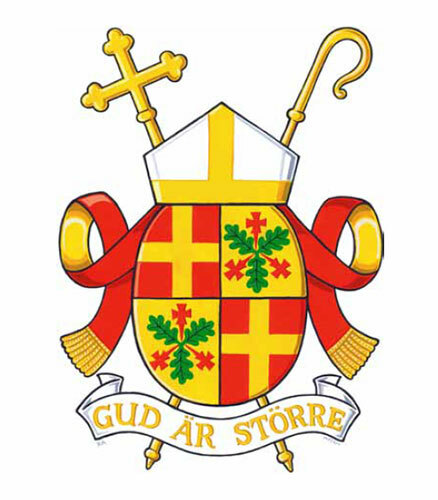 Present Arms of Antje Jackelén as Bishop of Lund. The External ornaments will not change when She becomes Archbishop as the Bishop of Lund due to the Fact that Lund before The Reformation was an Archdiocese, and are allowed the same ornaments as the Archbishop (Mitre, Crossstaff and Crozier, other Bishops only use the Mitre and Crozier). The Motto is in Swedish and translates as "God is Greater". Picture from the Official site of the Diocese of Lund. Last edited by Marcus Karlsson on 29 Oct 2013, 20:30, edited 1 time in total. The change in replacing the Or a Grill Sable of Lund with the Gules a Cross Or of the Archdiocese will acctualy improve the Arms heraldicly I think as the Tinctures will stand out more than Or bordering Or in the present Arms eliminating the need for the small Cross Sable dividing the Shield. Last edited by Marcus Karlsson on 15 Jun 2014, 15:40, edited 1 time in total. Antje Jackelen is of course female not male as Marcus knows. More importantly from the point of view of non-Swedes is that Swedish bishops quarter their official and personal arms rather than impaling them as we would in England and Scotland (and elsewhere in the Anglo-Saxon sphere of heraldic influence?). Are there other countries that follow Swedish praxis? Bishops in the zone of German heraldic influence usually quarter the see and personal arms. A very few American bishops also quarter, if the designs of the arms works better that way and if they realize they have the option. Marcus Karlsson wrote: The Motto is in Swedish and translates as "God is Greater". I believe quartering was actually the more common way to combine arms of office. In general it seems continentals were more flexible in how they combined their arms and treated arms of offices as fiefs. Perhaps because in some cases it was hard to tell the difference between a fief, and certain offices. In the Netherlands quartering is the most common, except for the archbishop of Utrecht he always places an escutcheon of his arms on the diocese arms. Yes I surely do, and I have corrected my misstake. There are given some examples of this and i might add that the two Finnish Evangelical Lutheran Bishops Arms I have seen also quarter. The RC bishop of Helsinki also usualy quarter, at least since the creation of the diocesan Arms of the RC Diocese of Helsinki. Ryan Shuflin wrote: In general it seems continentals were more flexible in how they combined their arms and treated arms of offices as fiefs. Perhaps because in some cases it was hard to tell the difference between a fief, and certain offices. As Ryan suggests, in many cases offices were fiefs. Bishops who were also the secular rulers of territories are the most obvious example, but in English common law all offices were technically considered a form of property, just like a fiefdom. One survival of this conception of offices is the wording of the documents by which the President commissions civil officers of the United States: "to have and to hold the said office, with all the powers, privileges, and emoluments to the same of right appertaining" is a direct echo of the age-old format of a grant or deed conveying landed property. Today Antje Jackelén was installed as Archbishop in a ceremony at the Uppsala Cathedral. Shaw it on TV and it was great pomp with all the Bishops of the Church of Sweden in attendance also the Archbishop Emeritus Anders Wejryd and foreign Prelates also the King and Queen and the Crownprincess Victoria. From the Site of the Church of Sweden th Arms of the new Archbishop which is painted by Ronny Andersen.